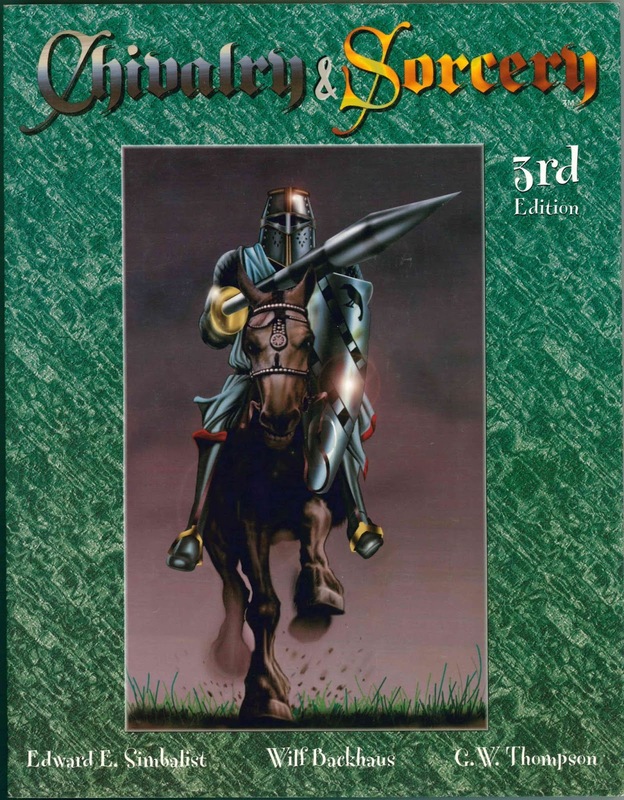 Chivalry & Sorcery 3e is G.W. Thompson's take on the work of Edward Simbalist and Wilf Backhaus, the original authors of C&S. It is interesting that Mr. Simbalist and Mr. Backhaus dedicate this 3rd edition to the Society for Creative Anachronism (S.C.A.) - a medieval society reenactment group. The S.C.A. educates its members about the feudal system practiced in Europe during the middle ages and its popular re-interpretation in literature including the King Arthur legends. The Society holds events where members dress in period costume and assume the manners and customs they associate with chivalry and feudal society. I believe that spirit is also present in C&S as a role-playing game. To appreciate C&S one must have some interest in medieval feudalism. The game, in all its editions, encourages role-play in a shared fictional society where the norm of play includes expected modes of behavior based on the code of chivalry, deference to those PCs and NPCs with higher social standing and an interest in the day-to-day lives of your imaginary characters. The reward is (according to the authors) an immersive experience only possible when role-playing in a believable setting. The 3rd Edition introduces the central mechanic concept to the C&S rules using what the authors call the Skillscape system. Basically it is a skill based mechanic using a d100 roll under test for success and a third d10, called a Crit Die, used to determine the quality of success or failure (thus rolling 3 d10). Each skill in the game has a success and failure table on which is described the Crit Die effect. Success on the wine making skill may result in an average vintage to a truly great vintage depending on the value rolled on the Crit Die. Failure in the wine making skill roll can vary results from disastrous to below average wine. C&S 3e remains a class based system. The character classes, referred to as Vocations, include Warriors, Thieves, Clergy and Mages with sub-classes of each. Skills, including those used in combat, are based on the Vocation (the word "class" refers to the social hierarchy in C&S). The Mage Vocations includes the Druid, Witchcraft, Enchanters, Magicians (Generalists), Necromancers, Power Word Mages and Thaumaturges. The authors say that the C&S 3e core rulebook is all that is needed to play the game. It is supported by the recommended Game Master's Handbook which includes information on how to create a fantasy setting, design monsters for the system, and advice on how to run a feudal campaign using the C&S game. A very brief bestiary is included at the end of the core rules, but the supplemental C&S Creatures Bestiary volume contains many more. Supporting volumes on Knighthood and Sorcery are listed in the back of the core book and may appeal to some seeking additional system material. Published in 1996, C&S 3e attempts to bring feudal role-playing to a more modern audience by offering a universal mechanic, the Skillscape system, an updated layout, new artwork, and a single volume presentation of the core rules. The updates are aimed at producing a game system where mechanics take a back seat to role-play, but the need to continually consult the rule book for the critical tables associated with every skill seems to be at odds with this goal. The rules to C&S have always been about perceived "realism" and produce a somewhat slow system, although one with a lot of period feel and flavor.